(CNN) -- Werder Bremen are through to the UEFA Cup final, where they will face Ukrainian side Shakhtar Dontesk, after winning 3-2 at Bundesliga rivals Hamburg on Thursday to progress on the away goals rule. 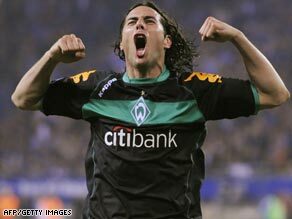 Claudio Pizarro celebrates scoring Werder's second goal in their thrilling 3-2 victory over Hamburg. Hamburg were favorites to qualify after winning last week's first leg 1-0 in Bremen, but Thomas Schaff's side responded brilliantly to recover from going a goal behind on the night, and 2-0 on aggregate, to secure their place in the Istanbul showdown on May 20. The defeat was a body-blow for Hamburg, who were also beaten by their rivals in the semifinals of the German Cup last month.